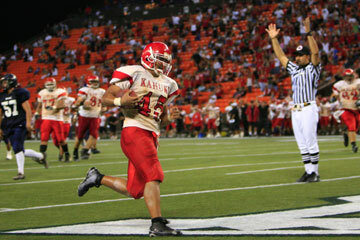 Kahuku's Junior Mataafa charged into the end zone for the game's only touchdown last night at Aloha Stadium. Once again, the Kahuku Red Raiders have spelled relief in red with the No. 45. Junior Mataafa, who ran for a game-winning score last week, bolted for a 25-yard touchdown run in the second half as Kahuku outlasted Waianae 7-0 last night for the Oahu Interscholastic Association Red Conference championship. The Red Raiders secured their fourth OIA crown in a row, and now have 18 league championships in all. "This was a straight-up team effort," said nose guard Kaniela Tuipulotu, who recovered a fumble that led to Mataafa's touchdown. "Before the game, in the locker room at Kahuku, we told each other the only way to pull it out is, this is a game of inches, and we just gotta hold our block a little longer." A crowd of 10,853 at Aloha Stadium saw results of that diligence. In the end, it was Mataafa, a backup to Lene Aumua, who benefited from an offensive line that gave him and Kahuku's backfield just enough of a crease to work wonders. Mataafa finished with 71 yards on seven carries, and Aumua had 51 yards on 14 attempts. "It feels great to bring the championship back home again," quarterback Richard Torres said. Kahuku (9-2) will draw a first-round bye in the First Hawaiian Bank/HHSAA State Football Championships. It will be the first state tourney for coach Reggie Torres, Richard's father, after more than a decade as the junior-varsity mentor. "We knew Waianae would be tough. They shut us down, but we were patient. It's been a season of being patient, even when we've been behind. I'm proud of our boys," he said, moments before telling the team that they got today off. The Red Raiders are in a bracket with Maui Interscholastic League champion Baldwin, and the winner of today's Leilehua-Mililani matchup. Waianae (7-4) was looking for its first OIA title since 1997. "We have nothing to be ashamed of. We played well," coach Daniel Matsumoto said. "There's nothing we can do about this loss. We'll concentrate on the state tournament." The Seariders will play today's Keaau-Kealakehe winner in the opening round of the state tourney. That game will be played on Friday at Mililani High School. The Seariders defense limited Kahuku to just 152 total yards, all on the ground. "Their linebackers are excellent," Torres said. "They were shutting us down." Waianae finished with just 150 total yards, including 66 on the ground on 30 carries. Quarterback Ben McQuown, accustomed to open space on rollouts, saw plenty of red all night. He was hurried into three interceptions. "It was hard on us. We're not used to coming from behind. We were forced to pass and I didn't do so good," McQuown said. Waianae's best chance to score might have been on defense. The Seariders pinned Kahuku on its 6-yard line after a punt, and after a penalty moved the ball back to the 3, they stopped Aumua at the 2. On the next play, Mataafa took the handoff and barely cleared the goal line, averting a safety. A 48-yard punt by Ian Rigterink got the Red Raiders out of hot water. Mataafa, a 5-foot-10, 195-pound junior, scored shortly after Waianae fumbled the ball away on its own 25-yard line midway through the third quarter. McQuown, struggling with the snap at times, lost the ball, which led to a wild chase deeper into Waianae territory. Tuipulotu recovered for the Red Raiders at the 35-yard line. Two plays later, Mataafa broke through left guard, shook off an arm tackle and raced up the right hash marks for the only touchdown of the game. Kahuku led 7-0 with 9:50 left in the third quarter. Waianae had five more possessions the rest of the game, but managed no points. The Seariders don't plan to lament the loss very long. "It's frustrating, but we're going to practice hard, keep our heads up and just play," linebacker George Kauwalu said. Nick Miyasato connected with Hogan Rosehill on a 26-yard pass with 2:40 left in the game to put the Warriors over the Wildcats in the Big Island Interscholastic Federation Division II Championship. Kolten Wong had a game-high 71 yards rushing for Kamehameha-Hawaii, and Miyasato passed for 104 yards. Nolan Reed piled up 58 rushing yards for Konawaena. Kah--Junior Mataafa 25 run (Kaika Sasaoka kick). RUSHING--Kahuku: Mataafa 7-71, Lehi Aumua 14-51, Richard Torres 7-16, Neal Lokotui 5-9, Ian Fujinaga 4-7, Sihloah Te'o 1-5, Pelefoni Soliai 1-(-7). Waianae: David Ferreira 6-23, Joe Abell 10-21, Justin Kauwalu 4-19, Cranston Newman 1-3, Danny Kekoanui 1-2, Ben McQuown 8-(-2). PASSING--Kahuku: Torres 0-3-0-0. Waianae: McQuown 10-27-3-84. RECEIVING--Kahuku: none. Waianae: Abell 3-38, Newman 3-13, Nigel Kawai 1-11, Miller Ualesi 1-9, Tyson Ranada 1-7, Danny Kekoanui 1-6. Kaim--Maua Tuitele 1 run (kick failed). Waip--Gil Fernandez 5 run (Paahana kick). Waip--Keo Palimo'o 6 run (kick failed). Waip--Jesse Doctolero 26 run (kick failed). RUSHING--Kaimuki: Stephen Harris 5-38, Chase Nanod 7-29, Joshwa Salvador 4-28, Keone Reyes 1-1, Tuitele 1-1, Perry Faleao 1-(-7), Kapono Kaiwi-Barrenuebo 2-(-15). Waipahu: Dayton Duff-Domingo 2-49, Doctolero 6-44, Palimo'o 11-40, Fernandez 10-32, William Tapu 3-19, Tyler Martin 4-7, Matt Soueira 4-5. PASSING--Kaimuki: Harris 4-9-0-26, Kaiwi-Barrenuebo 1-7-1-14. Waipahu: Fernandez 4-8-0-52. RECEIVING--Kaimuki: Christopher Etuale 2-20, Nanod 1-17, Romnick Paguryan 1-7, James Bower 1-(-4). Waipahu: Duff-Domingto 3-22, Soueira 1-30. Kona--Kenneth Whiting 10 pass from Keoni Balucan (kick failed). Kam--Hogan Rosehill 26 pass from Nick Miyasato (Tauati kick). RUSHING--Konawaena: Nolan Reed 14-58, Kawai Noa 17-39, Luke Knittle 1-3, Balucan 2-0, Whiting 1-(-1). Kamehameha-Hawaii: Kolten Wong 16-71, Miyasato 15-65, Reece Alnas 3-23, Mea Wong 1-7. PASSING--Konawaena: Balucan 1-4-1-10. Kamehameha-Hawaii: Miyasato 5-11-0-104. RECEIVING--Konawaena: Whiting 1-10. Kamehameha-Hawaii: Alnas 2-63, Rosehill 2-50, K. Wong 1-(-9).